Having begun with such a confident headline, the rest of this post will involve a lot of backpeddling. 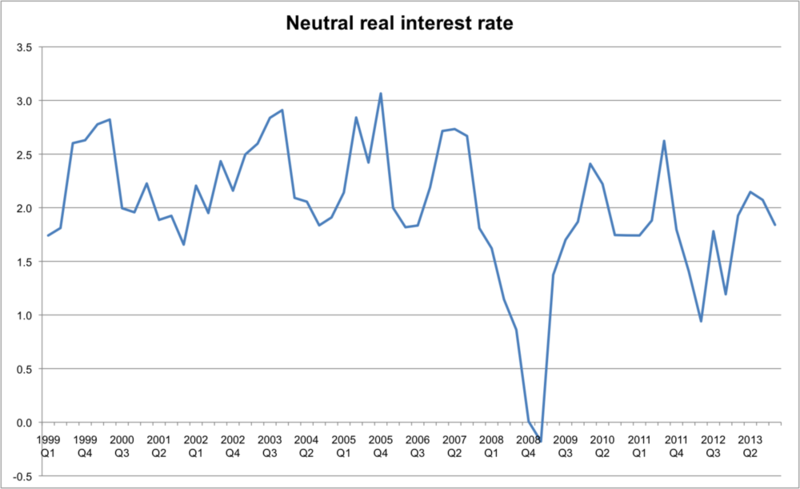 For many economists (not just Austrians) the Wicksellian rate of interest (or "natural" or "neutral" rate) is of central importance for macroeconomic stability. In fact, one might argue that it isn't merely an indicator of the monetary stance - it is the stance. In other words, the neutral rate today is equal to the long run steady real interest rate, plus the difference between expected Total Factor Productivity Growth, and the long run average TFP growth rate. I've not factored any population changes in, but an increase in working age population should increase our estimate. This estimate is a real rate, so shouldn't be compared to a nominal policy rate without correcting the latter for inflation. Beckworth and Selgin are obviously comparing this to a real Federal funds rate in order to get a measure of the monetary stance. The Bank of England's Bank rate isn't the same thing as the Federal funds rate, however, so it might be better to compare the estimate of the natural rate with an overnight interbank measure for the UK.